Bowls of this type were discovered at the Huangpu kiln site in Shaanxi province; see Tangdai Huangpu yaozhi/Excavation of a Tang Kiln-site at Huangpu in Tongchuan Shaanxi, Beijing, 1992, particularly pl.CIII, fig.5. Related pieces have also come to light at the Cizhou kiln site at Guantai in Ci county, Hebei province; see Guantai Cizhou yaozhi/The Cizhou Kiln Site at Guantai, Beijing, 1997, pl.XLI, figs 4 and 5. The shallow conical bowl is thickly potted, with a broad rim flange on the outside and a splayed foot with chamfered edge. The outer sides show ridges from trimming. The brownish-buff stoneware body is slipped, but the slip was largely wiped away on the outside, exposing the biscuit. 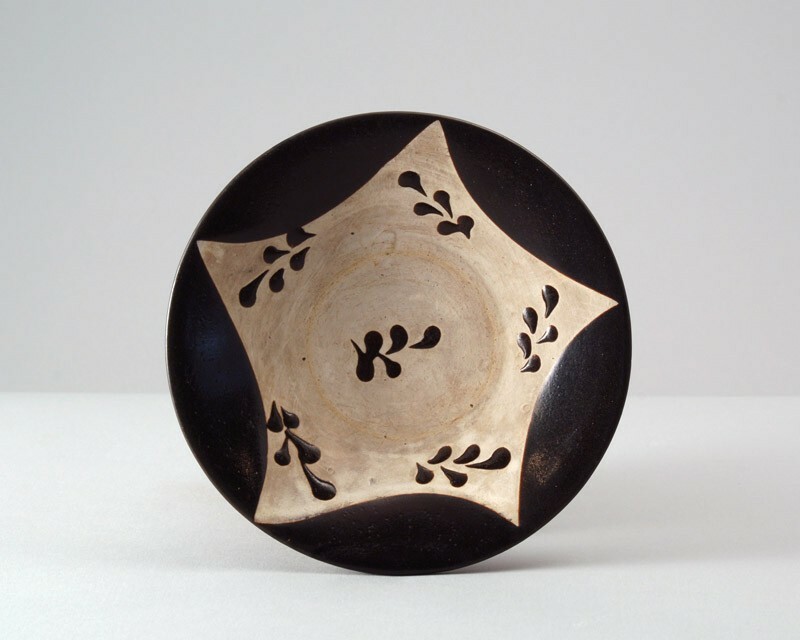 The piece was quickly decorated with six simple leaf sprays created by applying drops of thick black glaze and dipped five times into black glaze, creating five lobes around the rim both inside and outside.